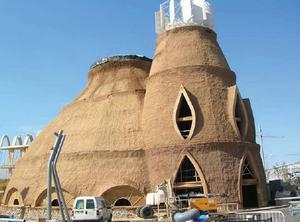 It may look like a large, odd-shaped mud hut but this is actually the Beacon building at the Zaragoza 08 Expo, the water and sustainable development expo running until 14 September in Spain. In July this became the first construction project in the world to be certified to the PEFC (Programme for the Endorsement of Forest Certification schemes) standard as all the structural timber elements of the building were sourced from PEFC-certified forests. It is constructed entirely of sustainable construction materials, mud, straw and certified timber, is sustainable, energy efficient and recyclable and provides a practical demonstration of one of the main themes of the Expo – environmental sustainability. The Beacon provides another step towards increasing awareness of the design possibilities for eco-buildings, the advantages of using sustainable construction materials and the responsibility to use certified timber which contributes to sustainable forest management practices and a reduced impact on the environment. Next Article How do those Olympic swimmers do it?